Today, I am mad and sad. Hurt and upset. Angry and scared. But I am also hopeful. Today, I want to say so much and yet nothing at all. I want to say that love trumps hate. That I will forever hope for a world of peace. That I do not believe there is any good reason for a civilian to own an assault rifle. That there is still--and always will be--good in the world. I wish I could say nothing because the world was not constantly at war. But I know that's not the reality. And I know historically, war seems to be a constant. That doesn't mean I won't continue hoping. Hoping for more tolerance. For more empathy. For less judgement. For more community. Hoping to raise my child, and any other children we have, in a world where he does not have to fear hate-filled people. Yes!!! We need more love that is for sure! What is happening to our world? This was just like the attack in the Paris night club. Things are getting scary. 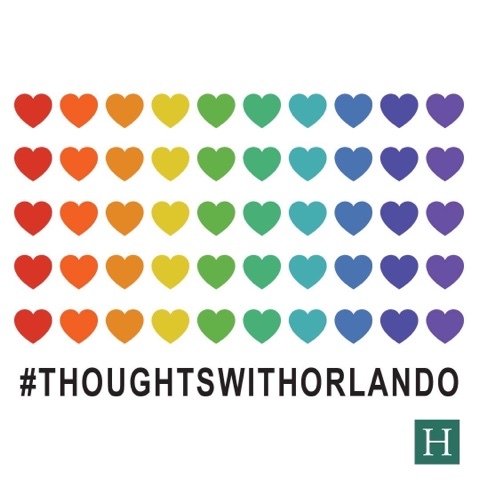 I am so sad with what happened this last weekend and this week in Orlando. My hearts breaks over it all.